While President Obama’s flight to China for the G20 summit was a smooth ride, things got off to a turbulent start as soon as he hit the tarmac in Hangshou this weekend. Chinese Government officials, feeling the pressure to make sure the entire summit goes off without a hitch, refused to provide Obama the proper staircase to exit Air Force One and clashed with White House aides and U.S. reporters on scene. Tensions rose as reporters were corralled under the wing of the Presidential plane and forbidden to view Obama head on as he exited. Furthermore, Chinese officials refused to allow the U.S. to use the standard rolling staircase they brought overseas for Obama’s emergence from the aircraft. The President was forced to exit out a rear set of stairs normally only used in high-risk areas such as Afghanistan as a safety precaution. Reporters were furious they missed their perfectly positioned President Obama arrival shots, being blocked even further by lines of Chinese Ambassadors blocking their views of the President along the red carpet. Multiple media reports paint a tumultuous situation on the ground describing a scene where reporters and Chinese officials were moments away from engaging in fist fights. “Calm down, please. Calm down,” a White House aide begged a reporter and a Chinese official who were close to turning the tarmac into a boxing ring. According to the pool report, there was even infighting among Chinese officials who went at it after one official was trying to assist the U.S. officials on the tarmac. After seeing how the guards were treating the American visitors he proclaimed, “You don’t push people. No one gave you the right to touch or push anyone around,” heightening tensions among themselves. Even Susan Rice, the U.S. Ambassador to the United Nations, made the mistake of thinking she was above the Chinese-imposed tenets of the tarmac and tried to slip underneath the media rope line. 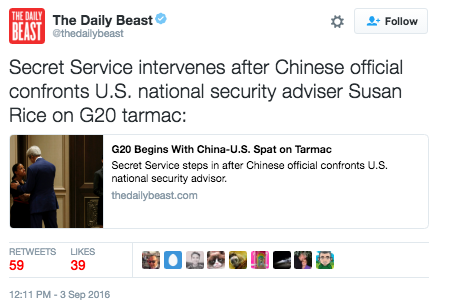 Rice was quickly halted from making her way to the motorcade by a Chinese official who only let her through once Secret Service intervened. The narrative that was created on the American side was that the Chinese snubbed the President by refusing him his rolling staircase. Though President Obama downplayed the incident saying the whole event was a nonissue, the Chinese were very verbal in retaliating against the allegations that their Government was attempting to be insulting. 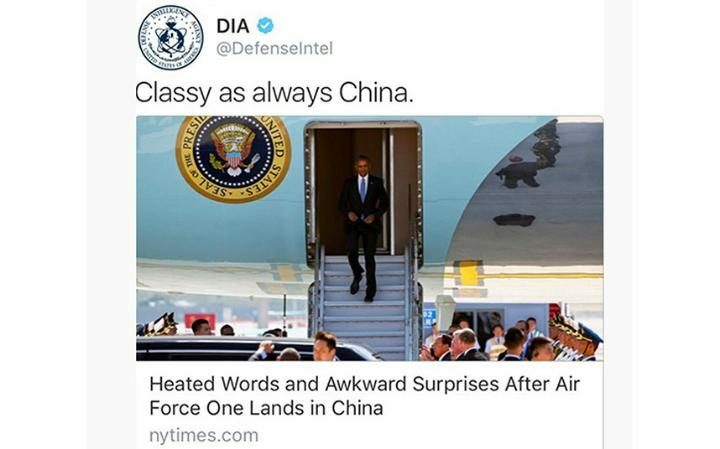 The Defense Intelligence Agency posted a sarcastic tweet about the matter, but quickly deleted and apologized for the humor. The consensus in China was that the U.S. was at fault for refusing to give up their stubbornness. “America was self-important in Hangzhou, American media falsely accused China,” read one headline on China’s military website. 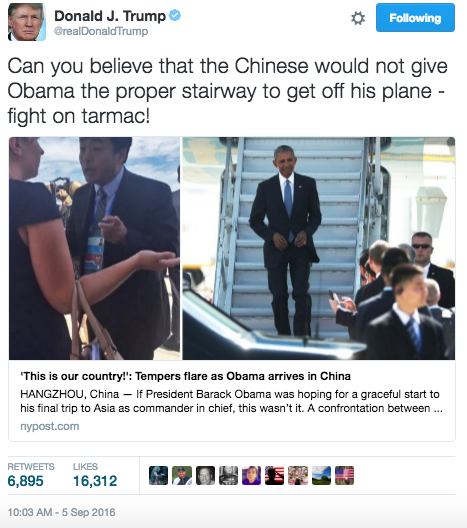 Though Presidential Candidate Donald Trump has criticized Obama in the past saying that “Obama should stop running down the stairs when getting off Air Force One” because he “doesn’t look presidential and at some point he will take a fall,” even he has come to the defense of the President chastising the way China handled the stair debacle. In an effort to create a picture-perfect summit, the Chinese Government ended up creating a bit of chaos and turmoil. Despite closing many of the roads and shops in Hangzhou, resulting in the normally busy city comprised on 9 million people looking like a ghost town, Chinese officials still managed to stir up some troubles elsewhere. Though America’s welcome to the summit was a little rocky, the G20 meetings continued undisturbed.